I'm a fan of butterscotch but it often is a baking chip that I don't usually buy unless I have a specific ingredient calling for them. But during this season, it seems as all baking chips are on sale which makes it a great time to play around with butterscotch chips in holiday baking recipes. This happens to be a great one to use them in. 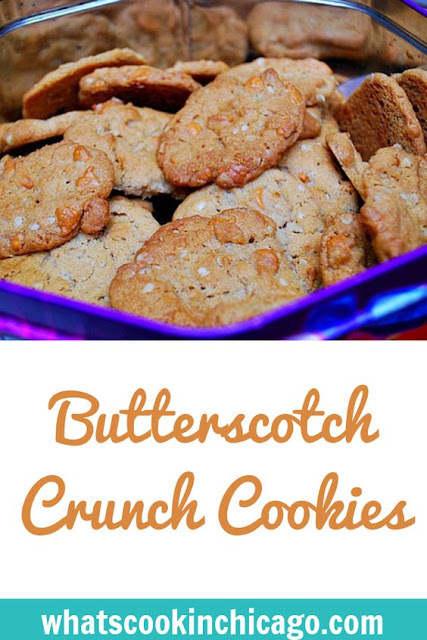 These Butterscotch Crunch Cookies have the flavor of butterscotch, the chewiness of an oatmeal cookie, and the crunchy texture from crushed cereal mixed in - what's not to love?! 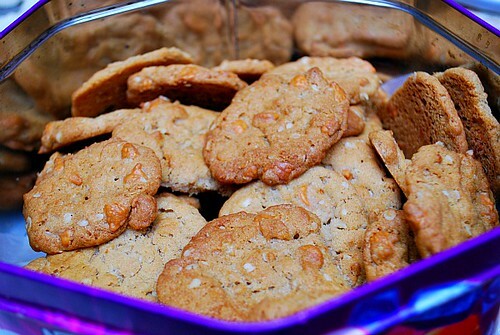 These cookies are another variation to the Chicago Crunch Cookies featured yesterday. You can mix it up by using whatever you have on hand as long as the ratios are right. Give this a try the next time you have butterscotch chips on hand! Add dry ingredients alternately with oil to the creamed mixture, ending with dry. Stir in cereal, oats, butterscotch and nuts. Lol - I know. I tried it with all Plugra but the cookies just spread way too thin and didn't hold their shape at all. I guess margarine helps keep the cookie together. Probably the cup of oil had something to do with spreading rather than butter, which keeps its shape well. This recipe is all over the place. Use great quality butter and mask with margarine and oil. Yeah.